These fanciful Hearts wall decals will delight your girly-girl by adding tons of fun and colorful personality to her room. Featuring hearts in many shapes, sizes, colors, and patterns, these RoomMates peel and stick wall appliques will add a little love to the room while transforming its look in minutes. Our RoomMates Hearts wall decals (also known as wall stickers or wall appliques) are repositionable, removable, re-usable, and washable... a parent's dream combination for kids' wall decorations. 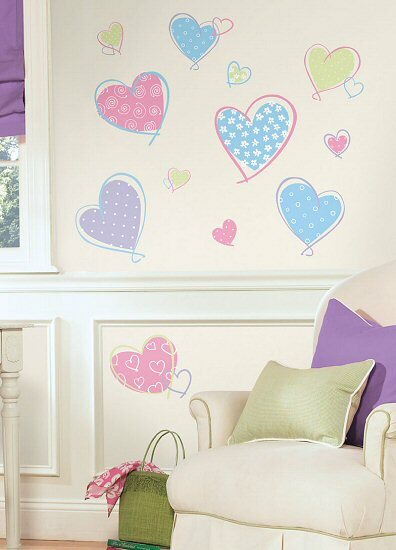 Whether you are transforming bedroom, playroom, or even classroom walls, our peel and stick Hearts wall stickers offer decorating ease with no damage or residue to the surface when removed. Approx. 2" x 1.75" to 9.875" x 11.25"
This unique Little Princess growth chart is easy to use and creates an enchanting atmosphere for your little princess.